Our Heavy Duty Vehicle Positioning Wheel Dolly Has A Built-In Jack To Let You Lift Individual Wheel Weight Up To 1250 Lb. 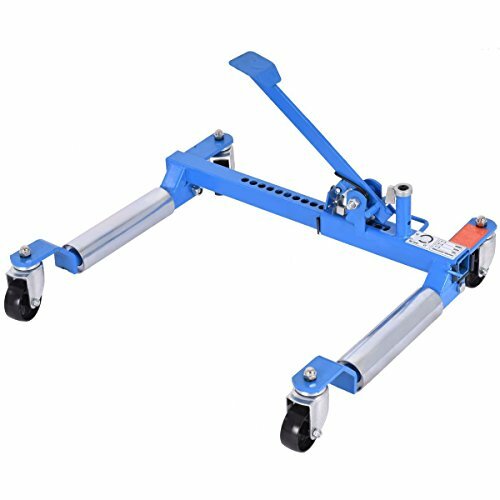 Using The Foot Pedal Ratchet System To Lift Up A Tire, Your Hands Are Free For Positioning And Making Safe Adjustments Which Is Convenient And Labor-Saving. The Self-Loading Wheel Dolly Comes With A Convenient Carry Handle, Smooth Rolling Swivel Casters And A Space-Saving Foldable Design. It Will Help You A Lot In Your Working. Do Not Hesitate To Buy One! Distance Between Slides: 15 5/8"-28 5/32"
Distance Between Rollers: 13 13/32"-27 5/8"
Distance From Floor To Bottom:1 3/8"
【Durable and Sturdy Construction】Made from high-quality steel, this wheel dolly could easily hold wheels or vehicles and is not easy to be out of shape. 【1250 lbs Weight Capacity】This wheel dolly could lift wheel weight to 1250 lbs, It is a simple but efficient method of moving a disabled vehicle around a shop environment and it is ideal for effortless movement of wheels and vehicles. 【Universal Wheels】This wheel dolly could be applied at any position for the universal wheels. And these wheels make transportation easier. 【Ratcheting Foot Pedal Lift for Hands Free】For the ratchet system, this wheel dolly allows you to keep your hands available for other tasks. And it would not be arduous by using foot to lift the wheels. Plus, the work efficiency would be improved. 【Perfect for Most Cars and Light Vans】This wheel dolly is fitful to tires up to 32" diameter and 10" wide. So it could be in common use in most cars and light vans. You could just put it in the trunk and use it at anytime and anywhere for most vehicles.